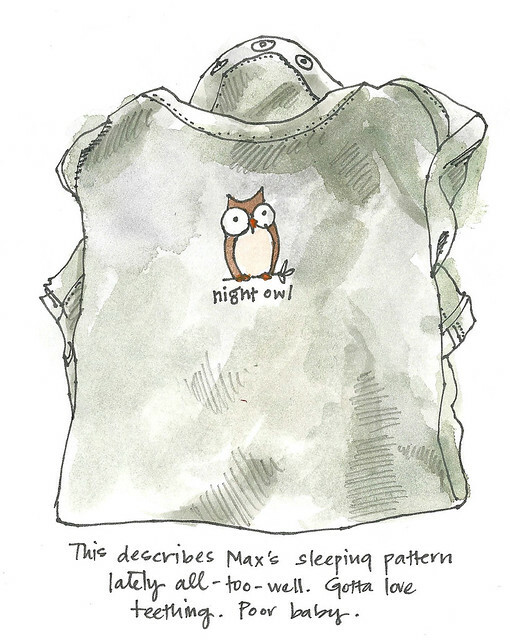 Thanks to Max, I'm neither a morning-person, a night-person, or a middle-of-the-day-person. I'm a zombie. Oh my, I can only imagine. I'm zombie-like enough with just ONE baby (and no naps or sleeping in because of the toddler). I've been wondering how I'm expected to function when I go to bed late, get up several times in the night, and then get up early. I'm sure that twins are even more of that kind of fun! sorry about the sleeping patterns but love the t-shirt ! Ma pauvre ! comme je vous comprends! je viens de passer quelques jours chez ma fille Fauve et son bébé souffrait d'otite... les nuits étaient bien difficiles!!! Le dessin est superbe, conservez-le soigneusement. Il deviendra un bon souvenir plus tard! You will never view nighttime the same way again. I had an (I'll say it) AWESOME glider rocker with our youngest, and that boy wouldn't sleep anywhere but on me for the first few months. We sold the glider at our garage sale, but Christmas lights still put me in mind of that quiet little yellow room, string of moon and stars lights up for subtle ambiance, and a little man who would not quit looking up at me. Not a bad thing. I hope Max will shift schedules and sleep for you soon. In the meantime - I'll bet he has lovely big baby eyes looking up at you in all your zombie-ness. The great thing about being a mom - they'll wear you the heck out, but you love them all the more. I feel for you...those days of no sleep were killer. :( I hope you'll get to sneak in some nap. As a mom of six, I can relate! Our latest little one is an all night guy lately, too! I love your description of not being a morning or a night person. There seems to be a whole other dimension for those of us in this season of life!